We have just uploaded a review of NECA’s Alien Isolation Xenomorph figure from Alien Series 6 by windebieste! 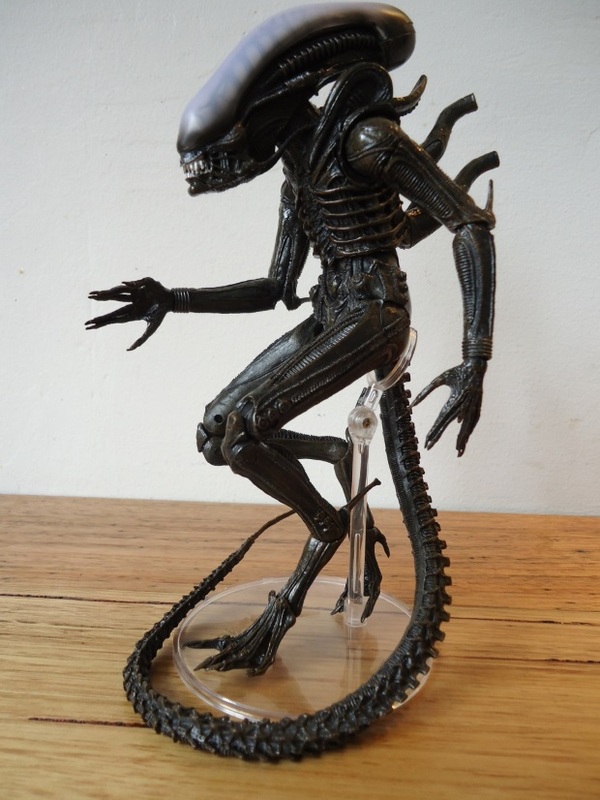 Released in December 2015, NECA released their incarnation of the games Alien design in as part of an Alien Isolation themed series that included also included 2 variants of the game’s protagonist, Amanda Ripley. “Multiple joints throughout the figure serve it well and while it’s essentially a reconfigured sculpt of NECA’s earlier Series 2 Alien, it possesses enough features to set its identity apart. It’s actually amazing how little changes have made this iteration differentiate it from the earlier version. The head, torso and arms will be familiar to owners of that earlier figure but substantial amendments to the legs and tail have been made to associate the figure with the creature that appears in the game. Be sure to check out windebieste’s review its in entirety and let us know what you think! If you head on over to our Articles section, you can also check out more of windebieste’s figure reviews! Going by that script description, I think Cameron just meant a hose-like tip for spraying the resin over walls, in place of inner jaws. Not some kind of massive elephant trunk-length arrangement. Also, even if it retracted partially inside the head or thorax, it looks like the primary jaws would have to stay permanently open. Drsmuts, im actually planning on building three four tier glass cabinets for my neca figures. One themed for Aliens, one themed for Engineers and one themed for Predators. Each shelf will display a different diorama with its own title and custom lighting and backgrounds. Unfortunately since Neca's figures are so big i've been having to constantly make compromises by changing my list of figures and think of different diorama schemes. As of now, i have no plans to include any marines from Aliens. I do, however, have plans for any Kenner tribute marines and aliens Neca has planned in the near future for one diorama i'm calling Bio-Mechanoids. As for this series, well, i always considered the blue warrior aliens i bought to be the drones while my black and brown aliens serve as warrior types sooo this albino alien will probably go to Bio-Mechanoids just because the theme is kenner marines vs Aliens that come from different host types in a ravaged lab complex corridor. Positives though? Hell yeah these figures are a must buy for any Aliens fan with room in their collection. I'm especially relieved they have straight faces. One of my biggest problems with the two versions of Hicks and Hudson that were produced was that the facial expressions were all wrong, with the exception of helmetless Hicks i suppose. In my opinion, Hicks with helmet should have had a straight face, one Hudson should have had a straight face with helmet and the other Hudson with helmet should have had the panick attack face. Heres hoping Neca gets it right by making ultimate versions of Hicks and Hudson with straight faces for the true Aliens fans who deserve it. I didn't buy any of the Hicks figures, but I love the "scared shitless" Hudson. It's hilarious and instantly identifiable as Bill Paxton in 'Aliens'. Who was the seller then for the Isolation xeno? Well the giant tongue of this albino alien makes it look as if it's been infected by the vampiric parasite from Guillermo Del Torro's The Strain, and perhaps it has just sucked someone dry going by the reddish colours running through it. It wasn't supposed to be that big though, was it? And I didn't know it had a really long tongue. I believe it was supposed to be a smaller and the size of the tongue isn't mentioned. I would think it'd only be a normal size. I do wish they'd have made the figure smaller but I do love them doing these concepts. I might not get this one but I loved the translucent one. Huh, that's interesting information. Thanks. Should I join now and check back when SDCC starts? Never mind. I thought I needed an account to buy something from the Neca Club store. But I guess not. Well I guess the microsecond Comic Con starts I'm hitting the web and getting that figure before someone else does. Thanks DaddyYautja, I really appreciate it. I stand corrected. I figured out how to register. But yeah, Neca did say they'll release info on how to get it these coming weeks. So I need to stay posted on Twitter. Why out of all the Alien figures did the Newt figure, the one I wanted the most, have to be SDCC exclusive? Don't answer that. I'm pretty sure they thought that it wouldn't sell very well if it was mass produced and decided to make a limited number. Oh well. The Ahab Predator was exclusive and I can still get that on that on ebay, it's twice as much, so there might still be hope. All in good time. They put up stuff on their Neca Club website during CC. Try to be on it during CC and see if you can get a purchase through. They sell them at the same price they sell them at the con. I'm just happy to have a Hudson that looks like Hudson. Both of them are fantastic expressions that really reflect the character in my opinion. I'd love to have a neutral expression Hudson, don't get me wrong, but not at the expense of another, unique character. I'm digging it a lot, loved how Vaz looked and Frost looks to be on point as well. I'm glad they fixed the helmet camo since they messed up Hudsons. I've skipped the past few alien lines but this one I'll pick up in its entirety. Ripley awakens, struggles to move. A drone is excreting cocoon material over her, anchoring her body to the wall of death. The drone is a small albino version of the Alien creature. Where the warrior has a set of striking teeth within its head, the drone has an excreting probe, like an organic stucco-gun. The air is thick with steam. Figures move back and forth, carrying eggs one way, returning empty. The taller silhouettes of warriors can be seen, moving with nightmarish grace. Vazquez looks stunning... and looks like she's worth getting. Will the smartgun be the same sculpt as the Kenner tribute Ripley accessory? Love the anemic Xeno! No doubt, this appearance is the result of its blood containing too much acid instead of hemogloben. lol. Yes. It reminds me of 'Resident Evil's licker as well. On the other hand, Giger was a very practical designer. He did state that the elongated head was justification to house a very long tongue. The albino's tongue here looks like it's very elastic and is being displayed at its full length on the figure. I'm guessing, like the tail, it will have a wire core and be a flexible body part. NECA should do the "Box Alien" as a concept figure. So...no positives at all for you in Vasquez, Frost etc? Frost looks fantastic. He's not my first pick for remaining marines, but I'll definitely be getting him. From that image he could be one of the best likenesses so far. This is turning into a great year. And I was supposed to be paring back the collecting! I don't recall the inner mouth being described as that long, but it's been a while. Does anybody have the descriptive quote to hand? Another white Alien... Okay! I'm gonna get it! Why? Just for the oddity which it is! Albino Drone reminds me a lot of The Licker in Resident Evil. Think I'll have to get Vasquez though! So cool! Don't think I dig that Albino Alien at all. Tongue is just weird & seems overly long. If they're gonna go that far & start making toys out of concept ideas then I hope to see more Kenner styled Aliens in the future. A redo of the Bull Alien, Gorilla n such. Frost looks decent at least. I don't know if you've played Starcraft, but I always pictured those drones as the creatures that harvest minerals and gas for the Zerg. They look a little like big facehuggers. I talked about it in that last recording. The tongue was for making hive gunk. Aliens albino drone from original Aliens script. NECA's released an image of their Frost figure. Part of Series 9 for August release. Are there any knockoffs known to be coming out of China? I bought a set of black and white Ninja Turtles from a seller in China and they all turned yellow. I figure they were a cheaply made knockoff... but I can't be certain. Was yours new in the packaging, though? Apparently there are quite a few Chinese knock-offs. You can try Tweeting the NECA account, he'll be able to pass any opinion and point you too the Customer Service account. I sent them a tweet yesterday evening and didn't get a response. I'll shoot him another tweet now. What seller did you buy from? I bought from a Hong Kong seller. Awaiting my delivery, their feedback was high and their Neca feedbacks were fine. I'll get the exact seller name when I get home. Anyway I took a gamble and opened the figure up and was able to straighten the jaw out (the lower jaw had popped loose from the socket, I've had it happen with other NECA Aliens). All the joints are tight, paint apps are good, if it's a bootleg then it's a really high-quality one. Cool that's good to hear. The thing about Neca is the products are made in China anyway and the bootlegs are made from the legit factory molds. Even official Neca products have manufacturing defaults anyway, my face-huggered Kane has wet paint issues which is a problem across the board for that particular figure. Yup. Sure was. Still is. Pulled it out of storage a couple of years later. All the limbs had yellowed. I bought the Alien Isolation xenomorph figure from an ebay seller in China, new in the packaging, and it just arrived today. The lower jaw is visibly all cockeyed in the packaging, which is kind of a disappointment given how long I waited for it to get here. Anyone have any experience with NECA's customer service with this sort of stuff? I haven't even opened the packaging yet, and I'm hesitant to complain to the eBay seller partly because he's Chinese and doesn't speak English, partly because I really don't want to wait for the turnaround time of mailing the figure back and getting a replacement just for that replacement to potentially be defective too (and the associated hassle in getting reimbursed on shipping fees, etc), and partly because it's not the eBay seller's fault - it's NECA's fault, the figure is visibly messed up in the packaging and it's not due to improper shipping or anything like that. Potential future 'concept' figure? Extant Dog Alien sculpt, maybe with series 2 Alien legs..? Would NECA re-purpose their moulds to do that kind of thing.. ? Um... yeah. I guess they would. I doubt Neca will do a version of the Alien warrior that looks like a guy in a costume. The versions we have are pretty accurate to what it was supposed to look like if it were a real Xeno. Though i would have liked a bit more articulation in their Aliens n Preds so i could get them in awesome realistic crouching poses. I actually wouldn't mind a special edition action figure of the Dog Alien with plantigrade legs. Cool video. Good job. This neatly compliments my take on the same figure. I really like it. It does feel like NECA are exploiting their already established Series 2 sculpt and the figure can be mistaken for a quick and dirty cash grab; but the whole translucent feature does have great appeal when displayed with a back lit light source. You should try it! This is where the figure really holds its own. Will the Loot Crate still be available by the time that people have received theirs and can confirm the contents? Again, I get that that's not the point, but I haev zero experience with Loot Crate. No, by the time it starts shipping, it won't be available to buy anymore (either by design, or by being sold out). I would be a lil disappointed because I don't have any NECA figures and I had been crossing my fingers for an alien figure, but oh well. See, I'd be disappointed in that. We have it already. It won't be a full-on 7" action figure in the lootcrate, but Lootcrate stuff does tend to actually be exclusive. Like I mentioned, NECA posted a photo on Instagram that seemed to show the cardboard "egg carton", but with the "Lootcrate" logo on it. Does anyone have any Loot Crate experience? Have NECA been involved before? How exclusive are the "exclusives". I have so far bought/ordered all of NECA's Aliens figures (but only two from the other films) and don't want to miss out (or pay through the nose on ebay) for a legitimate Aliens figure. But I would be disappointed if it wasn't from Aliens, or was a hokey repaint like an all silver warrior or something. I get that the surprise is the whole point, but is there any way to really speculate? Randy hasn't dropped any hints? I couldn't find anything online. I've heard its a carton of alien eggs, but i'll let everyone know when mine gets here. As will I. Please post spoiler warnings! but i'll let everyone know when mine gets here. Any ideas what the neca item in the loot crate box was? Based on the teaser image NECA posted on instagram, my prediction is "glow in the dark Alien eggs". No clue. You'll have to let us know when you get it!